im+m e-Library - by Jim Farmer and Jon Allen. Worth subscribing to its RSS feed. instructional media + magic, inc. a.k.a. im+m"develops standards-based multimedia courseware for colleges and universities, and the supporting information technology infrastructure. Based on research from early initiatives, im+m developed multimedia-rich classroom presentations and on-line courses leading to the improvement of student retention and performance". "From the Avalanche of Information regarding Higher Education. Source documents referenced in recent blogs and email and discovered during our own research." Currently, the e-library is particularly strong on North American material relating to the patenting of educational software. What is especially useful about it is its inclusion of blog posts, material from state agency web sites etc, all rendered as PDF files and stored by im+m, irrespective of their source. So this is a proper library, rather than just a library of potentially volatile hyperlinks. Can e-learning really make a difference to your business and staff? An opportunity to join a UK wide research project and find out. Howard Hills, who wrote a Guest Contribution about e-learning for public library staff earlier this month, asked me to include this item. "The Skills for Business Network work based e-learning project (based at e-skills UK) is conducting a major study to understand why UK employers are currently investing in e-learning and the difference it is making to their business and staff. This will give participating employers a unique insight into workforce preferences and what learners really think. The study investigates why organisations are investing in e-learning (which is defined broadly as the application of technology throughout the learning process) and what their successes and challenges have been. UK employers of any size who are already investing in e-learning programmes at work are invited to take part in a short anonymous, online survey. In stage 2 of the research, there is an opportunity to take part in a simple analysis of employee’s attitudes and responses to e-learning which is a unique chance for you to gather important internal feedback as well as contribute to the overall debate. Places for stage 2 are limited and we would encourage you to register your interest as soon as possible. Full details of the research are available from e-skills UK. The final report will be launched at Learning Technologies Conference in January 2007." YouOS is one to watch. Wikipedia-style software development in a "web operating system". "a web operating system that lets you run diverse applications within a web browser. Small applications like sticky notes or clocks. Large applications like word processing, mp3 players, and instant messaging. Even better, it's very easy to tweak an existing application or write your own." There is a longer piece about it - basically a 3 page "manifesto" - which is worth taking the time to read in full. Easily the most striking thing for me about YouOS (though the programming technicalities are beyond me) is that YouOS provides an environment in which users can create applications that run in YouOS; and that these applications are available for other users to rate, reuse, extend, and improve; with a set of tools available to help them do it. Think of it as a Wikipedia-style open source software development environment. YouOS takes the same approach. Of course at the moment, YouOS is not a fully functioning environment. It is only a few months old. Its owners describe it as experimental. It is probably being run on a shoe-string, though you would guess that investors are now knocking at WebShaka Inc.'s doors. But my instinct is that YouOS shows one way in which the Internet, and the services that are provided across it, will develop, with user-generated software, as well as content. Try the YouOS demonstration, or create yourself an account. A Virtual Learning Environment made in YouOS would certainly be in rather strong contrast to Blackboard, Desire2Learn, Moodle, or Sakai. You could imagine an interesting tie-up between the One Laptop Per Child and YouOS, especially in countries like Ethiopia that are investing heavily in network infrastructure. David Weinberger writes a long, fluent, and searching piece about anonymity online, arguing for anonymity to be the norm online, just as it is in "face-to-face" life. "Before we have all this clear, we're going to have to make some decisions. My fear is that we are in the process of building a new platform for identity in order to address some specific problems. We will create a system that, like packaged software, has defaults built in. The most important defaults in this case will not be the ones explicitly built into the system by the software designers. The most important defaults will be set by the contingencies of an economic marketplace that does not particularly value anonymity, privacy, dissent, social role playing, the exploration of what one is ashamed of, and the pure delight of wearing masks in public. Economics will drive the social norms away from the social values emerging. That is my fear." Some years ago I enabled a couple of colleagues from The Sheffield College to attend a workshop at Penn State University, funded by the Sloan Foundation. The workshop produced these excellent guidelines on managing the workload of on-line tutors [85 kB PDF], and my colleagues returned from it full of praise for the skillful way the workshop had been run and the quality of the contributions. Hats off to the Sloan Foundation for funding a workshop next month in New Orleans concerning the use of Asynchronous Learning Network (ALN) technologies to permit continued delivery of university courses during disasters and other emergency situations. I have included, for information, the full invitation in the continuation post, with Ray Schroeder's permission. Automatic metadata collection. Humans not obsolete. For the foreseeable future. an overview of some other systems, services and products which claim automated metadata generation as either a direct or indirect output of their aims (this section forms about one third of the whole report). ".... the increased application of systems and process to automate metadata will not result – in the foreseeable future at least – in the obsolescence of the human in the metadata creation process. Whereas a computer can read, say, an IMS Manifest file and record all references of technical formats much faster than a human, a skilled cataloguer is able to make judgements on the practical application of the described resource within a learning environment in ways a computer cannot. Therefore, much of the metadata which can be automatically generated relates to its technical properties, repository users will typically need more subjective metadata to enable them to asses their retrieval results. The ideal situation is the two approaches to metadata creation working in tandem, with as much automated as possible to allow cataloguers to spend greater time on creation of metadata that cannot reasonably be expected to be automated. Concise, accurate recordings of technical properties and other elements which are consistent and overly mundane to warrant repetition on creation (such as vCard details), allied with human catalogued entries will provide the discovery user with both an overview of a resources' properties and limitations, and also allow the user to make a quick judgement on the relevance of the retrieved resource for a particular educational/learning context." Whilst writing this I looked back at Cory Doctorow's acidly written 2001 Metacrap: Putting the torch to seven straw-men of the meta-utopia, and chanced on this 2005 summary by Google of the way metadata is used in web pages (part of a longer, but still brief, December 2005 analysis by Google of a sample of slightly over a billion documents, extracting information about popular class names, elements, attributes, and related metadata). This seemed to show much human error there is in metadata creation (across the web as a whole, as against in content curated by information professionals). Footnote. Jorum is a JISC-funded collaborative venture in UK Higher and Further Education to collect and share learning and teaching materials, allowing their reuse and repurposing, and standing as a national statement of the importance of creating interoperable, sustainable materials. Talk by Steven Weber - author of "The Success of Open Source"
Here is .mov file with a witty talk by Weber - whose voice is disconcertingly similar to Woody Allen's - to students on Stanford University's Literacy of Cooperation course, in Winter 2005. The talk is wide-ranging, with, towards the end, an interesting excursion concerning the political economy of drug development in the pharmaceutical industry, and the parallels between drug development and software development, with an interesting emphasis on patents. If the talk encourages you to read the book, it will have done its job. Order book from Amazon. Whilst re-listening to the talk I came across a complete set of 9 edited videos of the Literacy of Cooperation lectures [18 May 2012 - link now dead], on Howard Reingold's SmartMobs web site. 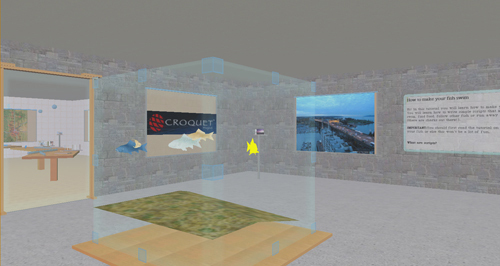 "Croquet is a new open source software platform for creating deeply collaborative multi-user online applications. It features a network architecture that supports communication, collaboration, resource sharing, and synchronous computation among multiple users. Using Croquet, software developers can create powerful and highly collaborative multi-user 2D and 3D applications and simulations. This open source release of the software developers kit makes it possible for experienced software developers to work with Croquet. It is the first complete release of the Croquet technology and marks a significant event for those interested in developing powerful collaborative applications." "Mapping mashups use online mapping services, such as those offered by Google or Yahoo, to display customized, clickable markers showing points of interest and related information. In the classroom, they can place lessons in a rich geographical context and increase interactivity. They can be useful for spatial display of research data or for enhancing information on campus Web sites." The guide struck me as too thin for comfort on practical examples and "how to" guides. What it really needs is an additional section of links of the form "to find out about this, go here, about that, go there". Suggestions? Update: 28/2/2007. Whether or not as a result of this posting, the JCQ site no longer requires you to access it via its terms and conditions page. Thanks to Julia Duggleby for pointing out the UK's Joint Council for Qualifications web site. It is dated 2004, but has plenty of recent content. It should be in some sort of "hall of absurdity".Try it for yourself and you will see what I mean. I especially admire the way the site attempts to get you to approve its terms and conditions before you can enter it. Once you know the URL of a page you want to use, or someone sends you a URL in an email, you can avoid the terms and conditions page entirely. And organisations that link to the page (see for example this search return by Google) need JCQ's written permission to do it. Before I wrote this piece I did try over a several days to call the Joint Council for Qualifications. I got "This number is temporarily out of order. We are sorry for any inconvenience".